My grandma got a leaflet with her most recent vegetable box from Farm Fresh which had a recipe for lentil salad. Now, I love lentils, but sometimes they can be a bit too earthy, taste a bit too…muddy. Not so with this salad. It is fresh and spring-like while still providing that lentil oomph that will make you full and keep you there. The roasted carrots and shallots add a lovely sweetness which balances with the deep, earthy flavor of the lentils and the zingy tartness of the lemon juice in the dressing. The fresh rosemary in the dressing enhances the lentils earthiness and helps amp up the freshness factor − I’m pretty sure dried rosemary wouldn’t have the same effect and since it grows all over the place, just wander around until you find some. I’m sure your neighbors won’t mind. The recipe calls for brown lentils, which we used, or Puy lentils, but beware that not all lentils are made equal and you definitely want something that’s going to keep its shape when you cook it. Red lentils would not work here. It may seem like a lot of dressing when you make it, but I think it gets absorbed into the lentils pretty quickly and you want some form of moisture, otherwise the salad would probably be a bit cloying. You also definitely want to taste the lemon juice in the dressing, that is a vital part of keeping this salad balanced and fresh. If you’re watching your waistline − who isn’t? − you could probably do with less olive oil, but I wouldn’t cut it out completely because it helps the lemon juice coat the lentils rather than just sink down to the bottom of the bowl. The measurements of salt in the recipe are for fine sea salt, so if you’re using coarser salt you will need to adjust the amounts, but lentils need a good amount of salt so don’t be shy. In any case, I think this salad is probably pretty healthy because the olive oil in the dressing and the tablespoon or so over the carrots and shallots is the only fat in it. And olive oil is good fat, right? That’s right. 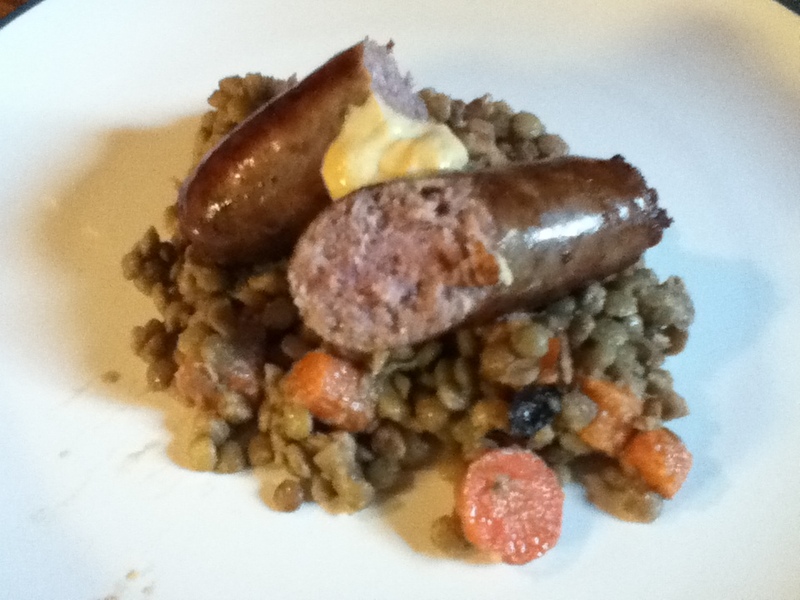 We enjoyed our lentils with a bratwurst each and a dollop of Dijon mutsard, which is not healthy but tasted darn good. 1. To make the vinaigrette, in a bowl, whisk together the lemon juice, rosemary and 1tsp salt. Slowly drizzle in the olive oil, whisking constantly until emulsified. Let stand at room temperature while you make the salad. 2. Preheat the oven to 425ºF (220ºC). Add the carrots and shallots to a baking dish, drizzle with olive oil and toss to coat. Season with 1/2 teaspoon salt and a grinding of pepper. Spread out into a single layer. 3. Roast carrots and shallots until browned in spots and tender, but not mushy, about 20 minutes. Remove from the oven and tent loosely with aluminum foil to keep warm. 5. Transfer lentils to a large salad bowl and add the carrots and shallots *not forgetting any vegetable juices and oil left in the pan!*. Pour the vinaigrette over the salad and toss gently to combine. Serve warm. Wine pairing: Goes very well with V Sattui Family Red 2010. 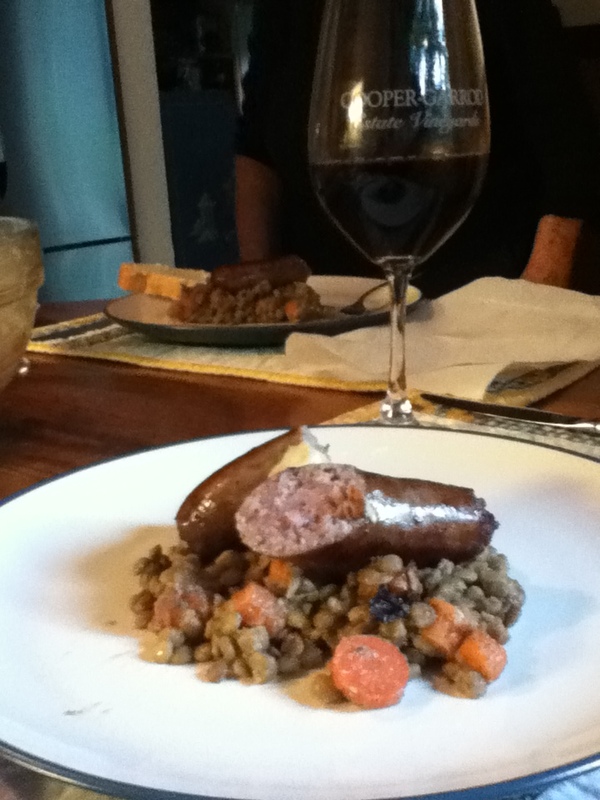 Very elegant with the wine and sausage – yum! It wasn’t anything fancy, but it was pretty darn tasty!